Do all near point activity at HARMON distance or slightly further. For reading, writing, and other near vision tasks it is important that the object being viewed be kept adequately far from the eyes. The working distance should be at least 40 cm (sixteen inches) for adults and older children, and at least 30-33 cm (twelve to thirteen inches) for younger children. When the viewing distance is shorter, the demands upon the focusing system become increased out of proportion to the few inches involved. This increases demand can lead to severe stress and strain. Therefore, maintaining an adequately long working distance is the foundation of good visual hygiene and depends upon good relaxed posture and proper lighting. Reading and writing while lying down, reading in bed, and other inappropriate postures tend to result in shortened viewing distances. Insufficient lighting also causes one to hold reading material inappropriately close in order to see it. When reading, occasionally look off at a specific distant object and let its details come into focus. Maintain awareness of other objects and details surrounding it. Do this at least after two or three pages. Desk work should be performed at an appropriately sized desk and on a surface inclined at an angle of 20 degrees. The chair should be of such size to allow the feet to rest comfortably on the floor. The buttocks should be flat and tucked fully to the back of the seat. Kitchen or dining room tables were not designed for studying or writing. They are usually too high and inappropriate for use by a child. Tilt the book up about 20o. Read in bed only when sitting upright – if at all. For proper lighting when reading in a chair, illuminate the entire area using overhead/full-room lighting. Next, have another light on your book – one that avoids bright reflection on the task. When performing any prolonged near work, take breaks if you begin to feel your neck, shoulder, or back muscles beginning to tighten. Don’t get “locked in” when doing close work. Read or study no longer than fifteen to thirty minutes without interruption. Look up at a distant object as you turn each page, and try to get the distant object clear before beginning to read the next page. Looking back and forth from distance to near while reading reduces the tendency of the focusing muscles to become cramped. Be aware of your general surroundings while reading or viewing TV. Do not place desks against walls. Do not sit any closer to TV than is necessary. A minimum viewing distance of 2,5 to 3 meters is reasonable. Active outdoor play is an essential part of normal and healthy development. Play activities that require seeing beyond arm’s length should be encouraged. Posture: Sit with a straight back, with head straight, aligned for the task, neither tilted excessively forward nor backward, nor tilted to either side. This position should be maintained throughout all near activities. Avoid reading in bed or lying down. No lying on the stomach, no slouching, no curling up or other asymmetric positions. Distance: for reading, writing, drawing, hand-held video game, etc. : everything must be done at forearm’s length. For desktop computer, the screen should be placed at arm’s length (fingers must just barely touch the screen). 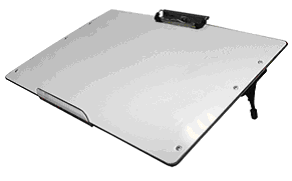 For a laptop, a working distance of 50 to 60 cm is recommended. For television: At least 2 to 3 meters, with head and back straight. If children or shorter people are working on a regular table (ex kitchen table), they should sit on a higher stool or a cushion. Otherwise, use a smaller table adjusted for their height. Lighting: Use general overall lighting in the room and add supplemental lighting as needed for the task. Make sure there is even lighting across your work. Never work in the dark. Taking breaks: a 10 minute break after a 60 minute period is beneficial. Note: This ends all that I had to say about myopia and the control of this condition. I hope these texts have made you more aware about myopia and that you will be able to help your child in the prevention or control of his or her myopia. Many years after Harmon’s studies, Drs Pierce and Greenspan have also studied the relationship between posture and vision. Once again, they have shown that there is an integral working relationship between posture, work distance and work surface. Their research has proven that learning performance improves when the proper conditions are established for near-point visual activities such as reading and writing. A century ago, classroom designers and teachers understood the importance of proper ergonomics in the classroom and the use of slanted desks in a learning environment. It is amazing how something so simple in concept, is so effective in application and can have such huge benefits. It begs the question: why were slanted desks taken out of the classroom in the first place? The simple answer is most likely the right one: it was more cost effective. Since flat desks were introduced to the classroom, reading scores have dropped considerably. European schools are now reintroducing slanted desks in their school classrooms and we too should rethink the ergonomics of learning. Finally, Sampedro et al. observed the characteristics of the spontaneous reflex reading distance (RRD) in 351 children in two stages, first in reading then writing, and comparing their RRD with the Harmon distance in the same environmental conditions. The results show that 72, 08% of the population analyzed (65% while reading and 53% while writing) had a normal RRD. Also, 50, 96% of people who had too short a RRD were myopic, 38, 46% were emmetropic and 10.58% were hyperopic. Conclusions: the shorter the RRD, the more mental effort is required in near vision; the situation creates more visual stress. So in this study, one third of the children were standing too near their work plan and the RRD was shorter in writing than in reading. More myopic individuals had a tendency to read closer than they should. No program that addresses myopia control would be complete without talking about the important concepts of posture and visual hygiene advices. There is ample evidence that conditions which lead to muscle tension and place undue stress on the visual system will, over a period of time, lead to eye problems such as myopia, and other disorders such as focusing and binocular coordination problems. Many authorities blame our culture’s emphasis, for both children and adults, upon prolonged near vision tasks (such as reading, writing, drawing, video games, computer work) for an increase in visual problems. While we cannot eliminate those tasks that need to be done, and may even be pleasurable, they can be carried out in a manner that imposes minimal stress on the visual system. If followed, these suggestions may result in easier and more productive study and desk work and will have value in preventing or retarding the development of visual problems. 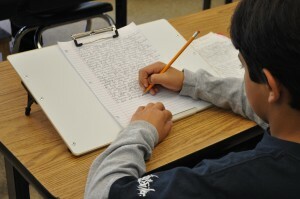 For reading, writing, and other near vision tasks, it is important to read or write at an appropriate distance. When the working distance is too short, both children and adults, it creates substantial additional effort on the focusing system and alignment of the eyes (convergence) This added stress can lead to eye strain and a which will increase stress symptoms. 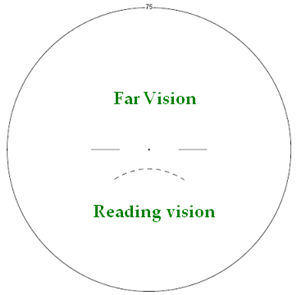 The spontaneous distance at which we read is called the reflex reading distance (RRD). This must always be compared to the Harmon distance. In the fifties, D.B. 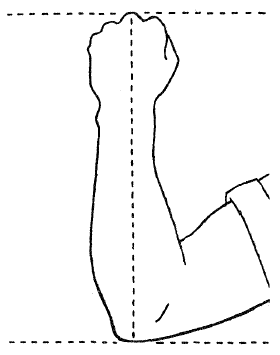 Harmon, an educator and a kinesiologist, has shown that the ideal reading distance for each individual was the distance between the center of the middle joint of the elbow to the center measured outside of the arm. Working at the Harmon distance reduces visual stress at close. Harmon believed that environmental factors were related to the development of visual problems and had an excellent understanding of the relationship between movement, posture and vision. In 1958 he showed that 30.2% of schoolchildren tested had postural problems that may be related to vision. Harmon also noted that using horizontal surfaces tend to require the student to lean forward and to approach its work plan. It is therefore preferable to use work plans inclined at 10 ° or even better at 20 °. Why 20 degrees? Harmon demonstrates that it is the physiological angle that everyone adopts between the horizontal plane passing through the elbows and forearms while reading, in an unconstrained outdoor environment. This position is accompanied by the facial plane parallel to the plane of the forearms. When we bend forward to read, this induces cervical stress, makes digestion more difficult and prevents adequate respiration necessary for the proper functioning of metabolism. When doing his study, Harmon raised the work-surface to a 20 degree angle, bringing the surface more parallel to the face. This significantly reduced the compression of the intervertebral discs. 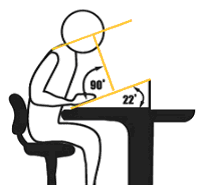 See the following image which shows an ideal working posture with a surface tilted 20 degrees. Harmon DB. Notes on a Dynamic Theory of Vision, 3rd Revision. Austin TX, Self Published, 1958. 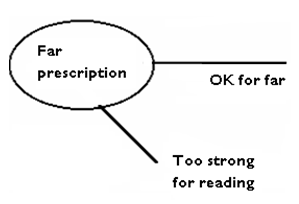 Previously, we said that when we correct myopia regardless of near vision (see image below), one will use an inadequate corrective power (too strong) while reading if the child reads with his glasses. The visual system is highly adaptable, and additional myopia will be created initially at near, and then will appear at far vision. If we increase simply the correcting glasses, a vicious circle sets and myopia progresses over time … This also applies to some adults whose myopia progresses. But if we respect the balance that exists between distance and near vision, there will be less effort when focusing and there will be less chance of progression. Unfortunately, this option will not always prevent some children to progress. When bifocals are necessary, they may incorporate either a small round bifocal that does not show much or we can design a special glass with two zones (far vision at the top and reading at the bottom) and the transition between both areas is invisible. Aesthetic is no longer an obstacle to an adequate correction for children. Child glasses with a small circular bifocal. I do not really like to use a progressive lens in the case of young myopic children. While glasses with two zones can be adjusted to prevent reading with the upper zone, you never know which area of the progressive lens will be used for reading. If the child leans his head too much, he no longer uses the reading portion essential for the proper control of myopia. The small hallway in the near vision portion of progressives will require the child to move the head and not your eyes. The more we obstruct peripheral vision, to more visual stress we cause. Regular contact lenses correct only the far vision as glasses that contain only the myopic power, unless they are multifocal. Regular lens wear creates the same situation as to wear glasses for distance vision only: if used for reading, writing and computer for prolonged periods, we may see a more rapid progress of myopia. So, wearing regular contact lenses should be limited to outdoor and sports wear. As there are many reading and writing activities at school, wearing these contact lenses is not recommended. Some studies have shown that there is a more rapid myopic progression with contact lenses that correct distance vision only than glasses to see far. The results found in this study show a definite trend towards poorer accommodative (focusing) and vergence (alignment) function with the use of contact lenses in comparison to glasses. This downward trend is possibly creating a lag in accommodation to reduce associated overconvergence. The higher accommodative lags found in this study with single vision contact lenses indicate that prolonged use of these lenses in near tasks may provoke a continuous hyperopic retinal defocus, a risk factor for the onset and progression of myopia, as indicated in numerous studies. Jiménez R, Martínez-Almeida L, Salas C, Ortíz C. Contact lenses vs spectacles in myopes: is there any difference in accommodative and binocular function? Graefes Arch Clin Exp Ophthalmol. 2011 Jun;249(6):925-35. Before the availability of multifocal contact lenses (which contain both a correction for distance and near vision), a young myope who wanted to wear contact lenses often had to wear reading glasses (spectacles) for near vision in order to counter the effect of the power of his myopic lenses, or remove the contact lenses. 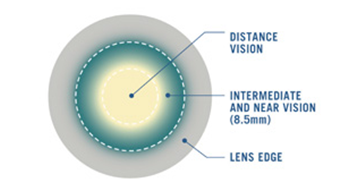 Contact lenses for young myopes: distance vision is at the center of the lens and reading vision lies in the periphery. Example of a contact lens Proclear EP (from Cooper Vision). There are now several other designs. Bifocal contact lenses are worn during the day and removed at night. They give clear vision for objects far away and objects nearby. Generally they are worn every day although occasionally a day without the lenses will not adversely affect the treatment. The lenses are worn as long as myopia progression is considered a risk. Bifocal contact lenses have been shown to slow the progression of myopia. The reason they apparently work is not that they reduce the reading effort, which they do, but rather that they create a ring of increased power surrounding central vision that the eye interprets as a “stop signal” for further growth thus reducing the progression. There have not been many published studies of soft bifocal contacts being used for myopia control, but the Aller and Wildsoet study showed an 87% reduction in myopia progression for the first year. 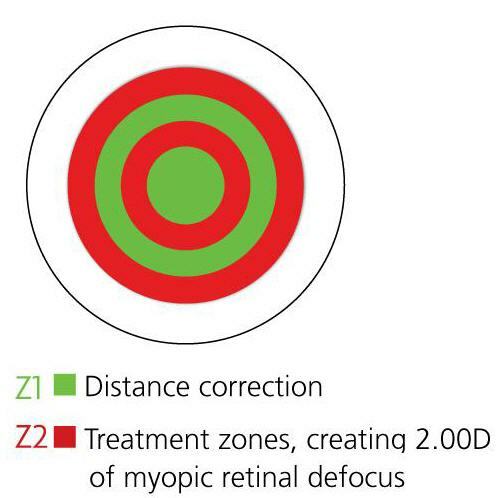 Dr John Phillips of the University of Auckland, New Zealand described a dual-focus soft lens with a central correction zone and concentric treatment zones. The lens reduced myopic progression by 37 per cent over 20 months in children aged 11-14 years compared with a standard contact lens. Half of those wearing the lens had their myopia progression slowed by 50 per cent or more, but the effect might be up to 80 per cent in future if combined with medication. Anstice NS, Phillips JR. Effect of dual-focus soft contact lens wear on axial myopia progression in children. Ophthalmology. 2011 Jun;118(6):1152-61. Professor Earl Smith of the University of Houston said that myopia control lenses needed to be fitted at an early stage and to very young children. Each of these studies is for one year. Other non-contact lens methods have been found to have less effect after the first year and so it remains to be seen if the contact lens effect is multi-year. This study has altered our thinking with regard to myopia development and effective treatments to reduce progression. Through extensive research Dr. Smith found that peripheral defocus triggers growth of the eye in a way that leads to an increase of myopia. The signals for this growth are in the peripheral retina. This axial elongation of the eye increases myopia and promotes myopia progression. Ortho-K (short for orthokeratology) is a process of gently reshaping the front surface of the eye (in fact, the cornea) to give a clear and comfortable vision. Indeed, the corneal tissue is very malleable and by a slight pressure due to the contact lens, we can change the curvature of the central cornea. This is a non-surgical procedure using specially designed customized contact lenses that are worn only at night and removed when awakening. The result is a clear vision all day without lens wear during the day and without glasses. The lenses are inserted in the eyes every night since the procedure is not permanent (such as laser treatment), making this therapy safer for children. When the lenses are removed from the eye for a few weeks, the curvature of the cornea slowly returns to its original shape and myopia also returns after several days or weeks, to its initial pre-fitting parameters. There are many designs of OK lenses but they are mostly equivalent, and all have the goal of reducing myopia overnight by changing the central curvature of the cornea. Orthokeratology is a great way to slow the progression of myopia (see www.myopiaprevention.org). Children are excellent candidates for orthokeratology because they are motivated, quick to learn how to care for the lenses and respond quickly to the treatment. Ortho-K lenses are also great for kids who participate in sports activities, because they do not have to worry about losing their contact lenses while they are active. It is a safe alternative to LASIK or other refractive surgery procedures that are not even available for children. Even if myopia cause blurred vision at distance (at far), we know that the origin of the problem comes from using our eyes at near. And often we need to correct the near vision to try to solve the problem. What can be done? Can we prevent this condition? We consider that the refraction state “normal” when a child’s shows a light farsightedness (or hyperopia) which protects against myopia, by acting as a “shock absorber». With time, we can note in the visual examination that some children decrease their farsightedness towards emmetropia (meaning that the child is neither farsighted nor nearsighted). When the child is emmetrope, there is only a slight step to become myopic. And this step sometimes happens very fast. When we realize that the farsightedness is disappearing, it is necessary to begin to correct the near vision before appears myopia. We favor bifocal lenses so that the child can see at far and at close without removing his glasses constantly. It is also possible to consider reading glasses only. These lenses are adapted to the near vision: they decrease the tension of how the eyes center and improve the functioning of the focusing system of the eyes. Even with a little degree of nearsightedness, far vision is significantly reduced. 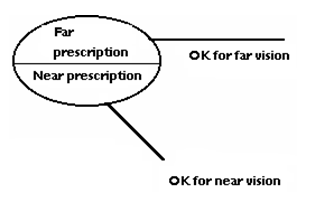 A complete visual examination will allow us to estimate if we have to correct the near vision and if we have to correct only a portion of the myopia present. An option, which we unfortunately see too often, is the sole correction of myopia, without taking in consideration the near vision. This last option is the one that can cause most disadvantages. Indeed (see the figure which follows), if we simply correct the myopia, the child will see more clear at far but will be reading through a power of myopia which is not needed for reading. Thus, the myopia will tend to increase ceaselessly. Sometimes, we see children who double the quantity of their myopia every year! From 0 to 6 years old, the eyes, like the rest of our body, will grow and all parts of the eye are involved and thus, in the retina, the eye should always receive a clear picture. This growth is called emmetropization and should end around the age of 6 years. This process attempts to eliminate nearsightedness or excessive farsightedness in children. It seems that in some children, emmetropization does not stop. This creates a defocus (or blurring) called “hyperopic defocus” in the region of the peripheral retina, thus the periphery of the retina sends a chemical message (via modulators) which will aim to restore the focus by changing the refractive power or size of various parts of the eye… resulting in myopisation. 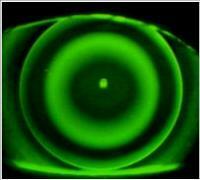 The problem would be that focusing of the central retina and the retina in the periphery is not simultaneous. 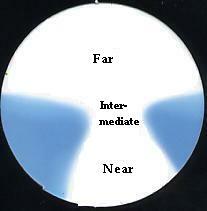 This is the same process that is triggered when one corrects myopia regardless of near vision (middle image). Visual acuity is restored but the peripheral defocus persists when the child uses his near vision. Hence the possible increase in myopia over time. A correction that takes into account both distance vision and near vision (right image) is much more appropriate. Lin Z, Martinez A, Chen X, Li L, Sankaridurg P, Holden BA, , Ge J. Peripheral defocus with single-vision spectacle lenses in myopic children. Optom Vis Sci. 2010 Jan;87(1):4-9.